I don’t like my desk. There’s nothing wrong with it, nor is it lacking in space or functionality. 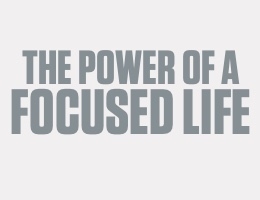 It’s just…not inspiring. It may not seem like a big deal, but the desk is the unsung hero of a productive setup. It’s the stage upon which most of my day’s work plays out, so having it look and feel the way I want makes a tangible difference. Part of solving the problem might entail getting an entirely new desk, but that’s expensive and leads me down its own rabbit hole of standing vs. sitting, materials, features, and so on. 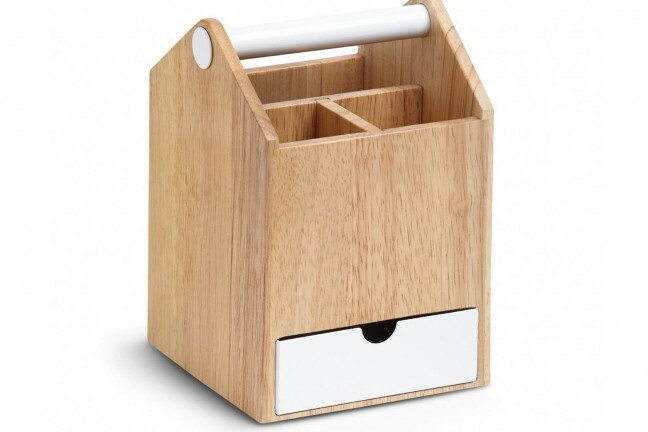 Instead, I’ve been able to delay all of that thanks to a truly remarkable set of desktop accessories from Grovemade. Over the past few months, I’ve added most of their Desk Collection to my setup. It includes a monitor stand, a tray for my Magic Keyboard 2, a wrist rest, a mousepad, a pen holder, and a unique desk lamp. The entire set showing off the walnut-on-black look. 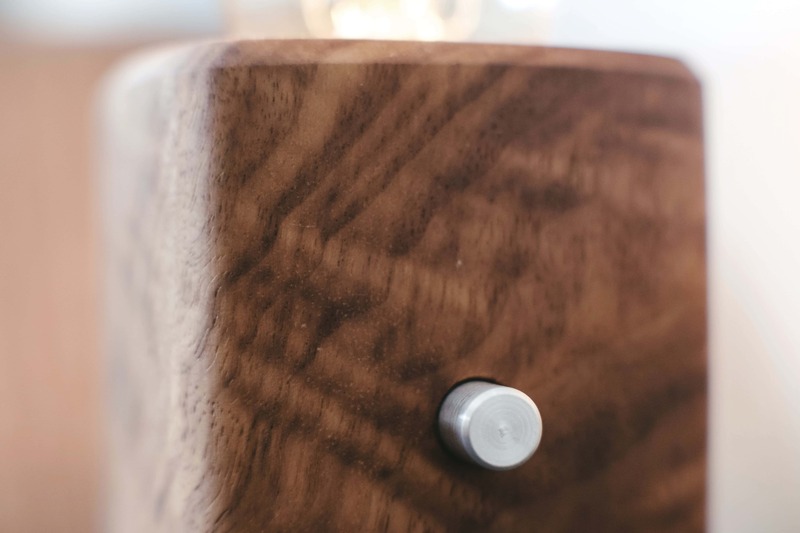 Each component is designed and manufactured in Portland, Oregon from hand-finished Claro Walnut (there’s also a brighter finish available in Eastern Hardrock Maple). 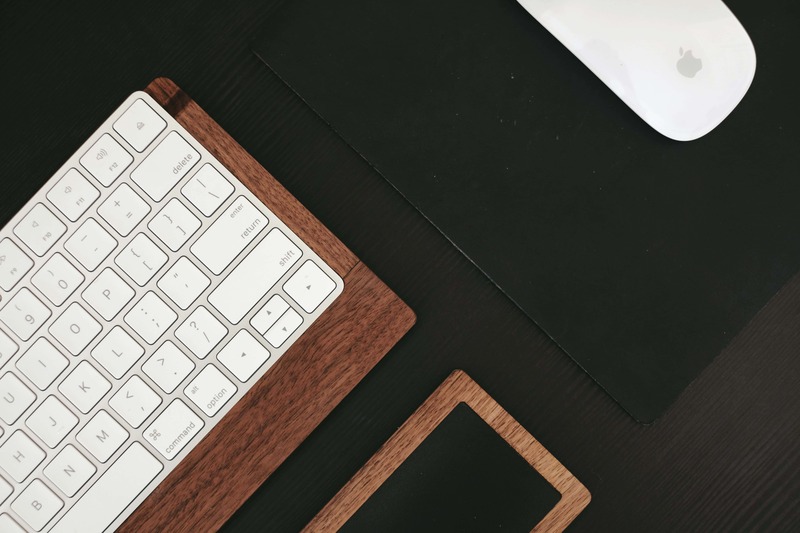 Both colour options are superb, and choosing one will come down to what matches the surface of your desk and your general office setup — along with personal preference, of course. The Walnut finish features vegetable-tanned leather accents in a deep black. The overall look is refined, sophisticated, and elegant. The Maple finish is paired with a reddened leather that imparts a slightly more rustic, casual look without sacrificing any of the precision or elegance. 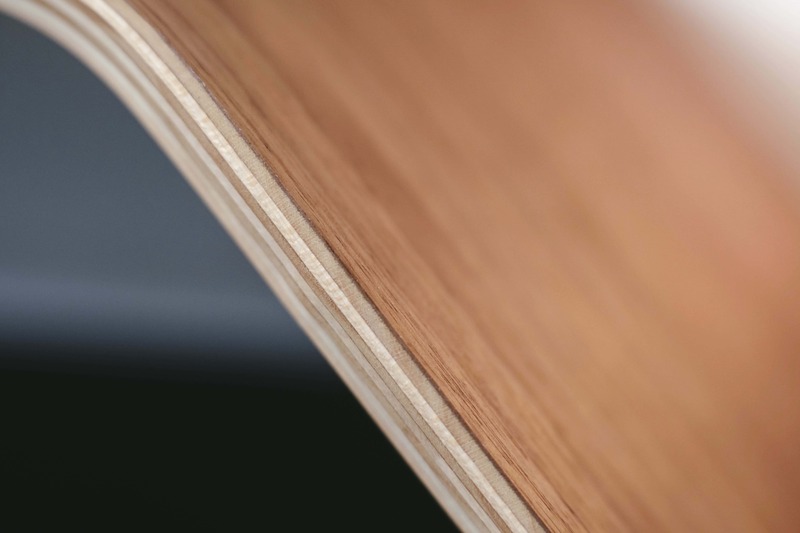 The wood is beautifully machined, with smooth curves and a soft finish. 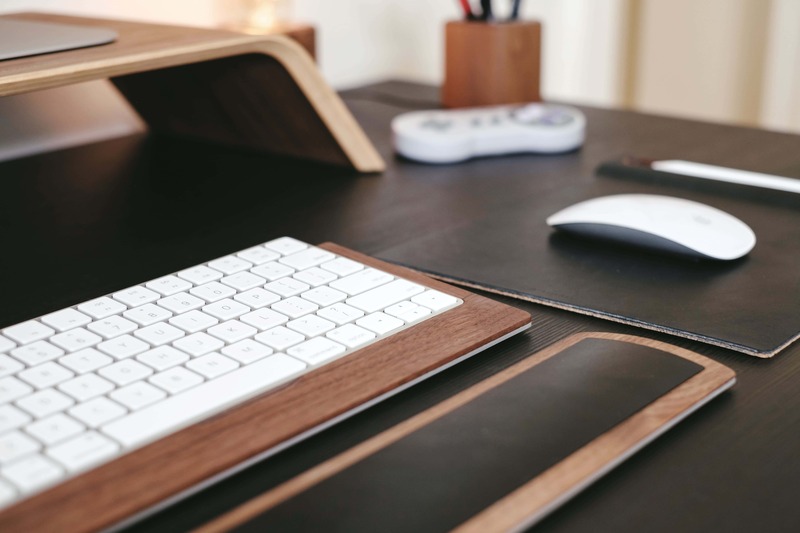 I opted for Walnut thanks to the bright maple surface of my desk, but I’ve also tried it on a black desk and I find that it looks great in both contexts. Either way, having a unified look to my desk accessories makes the same set of objects look less like a random assortment of things strewn about and more like a considered, organized workspace. Together, they’ve elevated the aesthetics of my desk and have provided ergonomic benefits too. I’ll discuss each piece individually, but it’s worth stating up front that the whole is greater than the sum of its parts with this collection. 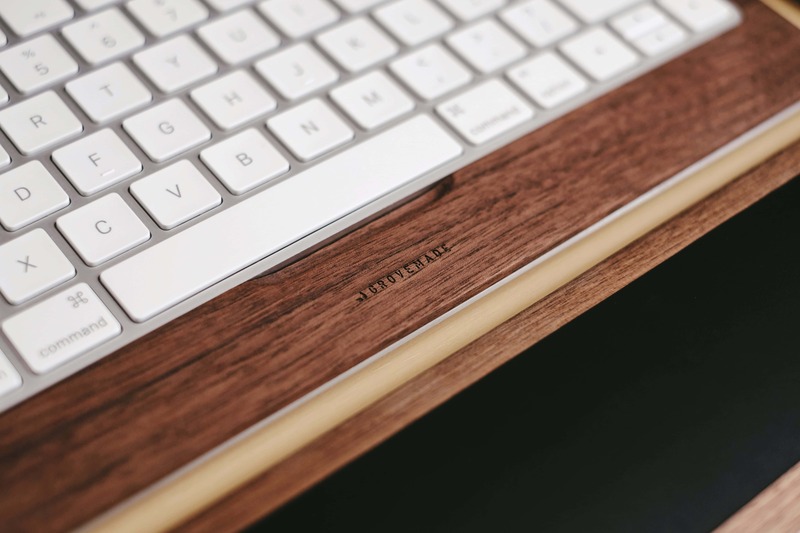 The central part of the Grovemade Desk Collection is the keyboard tray. 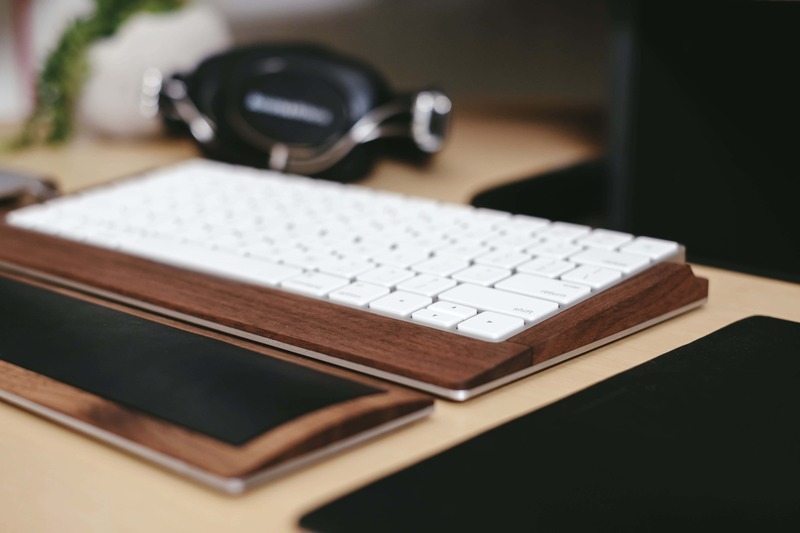 It’s a snug-fitting wooden sheathe that subtly elevates the keyboard, positioning it at a more comfortable angle for typing. The keyboard tray and wrist rest are made for each other. I wouldn’t get one without the other. There are two models, one for each generation of Apple Keyboard. It won’t work with any other keyboards, and the models aren’t interchangeable, so make sure you choose the right one for your keyboard model! 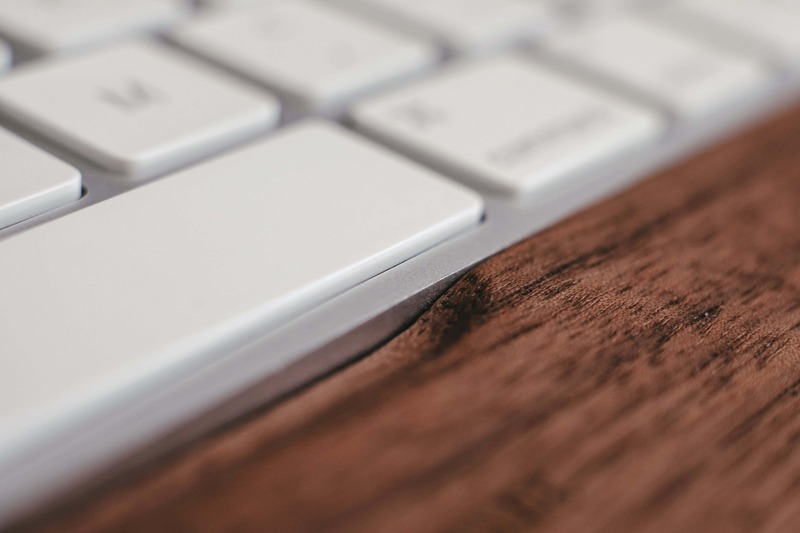 The wrist rest can be freely positioned beneath the keyboard to provide some extra support. It forgoes the squishy memory foam padding of common store-bought examples in favour of a firm, leather-wrapped pad encased in the same classy wooden finish as the rest of the collection. Despite not being pliable, the wrist rest is very comfortable. The combination makes for a satisfying typing setup, both from an ergonomic and stylistic perspective. I noticed a difference in how my fingers felt after writing long pieces — there was less stretching needed to reach the upper keys, leading to a more relaxed typing position and less fatigue. The level of precision on display in the manufacturing is impressive: there’s absolutely no wiggle room. I’m especially impressed by the craftsmanship of the pieces. The keyboard fits flawlessly in the tray, with absolutely no wiggling or instability. It’s clearly been machined to tight tolerances. 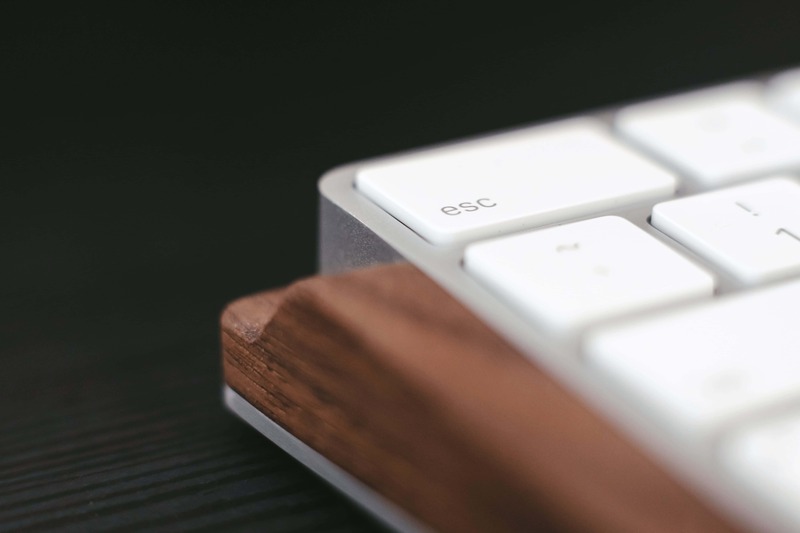 Its edges are flush with the wooden sides, and the subtle metallic accenting around the outer edges of the tray match the Magic Keyboard’s finish perfectly. The small notch at the front of the tray makes it easier to remove the keyboard. Even still, the tolerances here are impeccable. Smart design extends to the top of the tray as well. The small notch on the left side allows for easier removal from an otherwise tight fit. This attention to detail also manifests in practical details, like a small cut-out along the front edge of the keyboard tray that makes it possible to push the Magic Keyboard out just enough to make it easier to remove. The top surfaces are almost devoid of branding. There’s a very small Grovemade logo carved into the area immediately below the keyboard, but it’s effectively invisible. Instead, the company signs its work with an attractive stamp on the bottom of each piece. Understated branding on the keyboard tray, with a small groove carved out above it to make removing the Magic Keyboard easier. Looking for this logo reveals the cork underside that keeps the pieces from shifting around on your desk. In several months of usage, I’ve found that the cork provides the ideal balance between stability and ease of changing position. Unlike tackier materials, it leaves no residue and won’t “stick” to the desk surface in hotter weather. 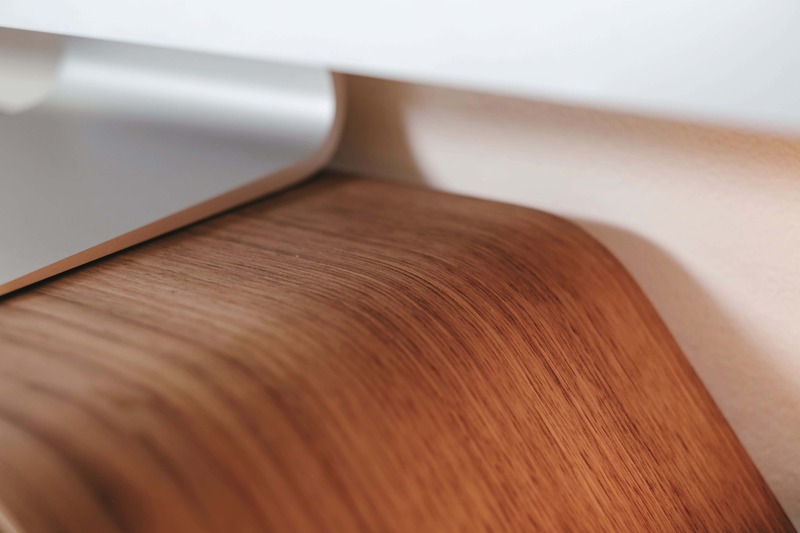 Each component of the desk collection has a cork foot to help keep it from sliding around. 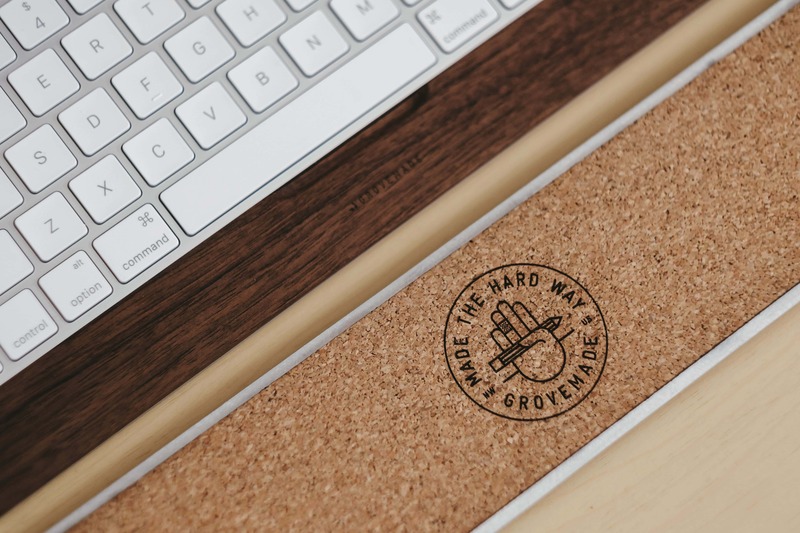 Hot weather is the only potential downside of the Grovemade Desk Collection, as the choice of leather means that humid conditions can encourage sweaty wrists to stick to the pad. Of course, this won’t be an issue in properly air conditioned environments, but it’s worth mentioning for cases where temperature and humidity fluctuations are a concern. The second pillar of desktop computing interaction is, of course, the mouse. And there’s a Grovemade product for that. 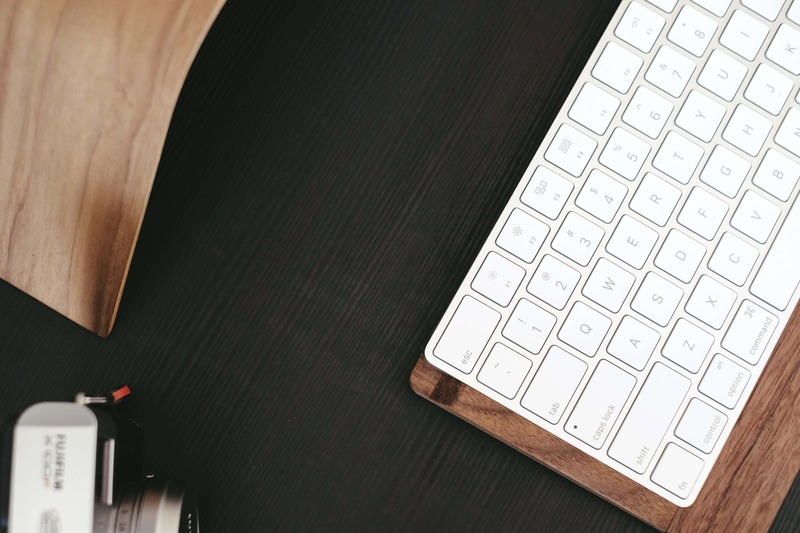 The mouse pad is home to more than just your pointing device: it can also house your favourite writing implement. Beside my keyboard tray and wrist rest, I have the Grovemade mouse pad. 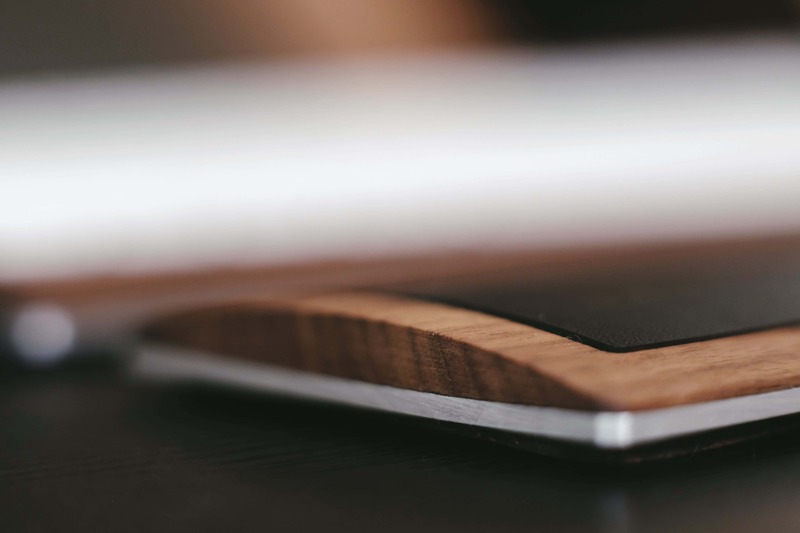 The pad is generously sized, matching the combined dimensions of the keyboard tray and wrist rest almost perfectly, which leads to a pleasing visual balance when the components are arranged on the desk. There’s no wrist rest for the mouse, so if you need one you’re stuck either using the one from the keyboard or supplementing a third party option. I don’t typically use mouse pad wrist rests, so for me it was a non-issue. 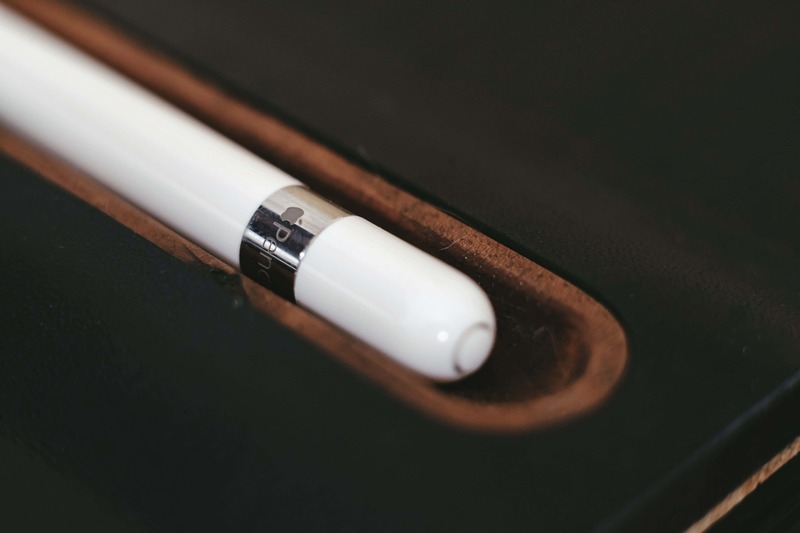 The pad itself has a low profile — it’s little more than a strip of the same vegetable-tanned leather attached to a layer of cork to keep it from sliding around. What’s unique about it is the right side, which features an elevated, wood-lined basin that acts as a holder for your favourite pen or pencil (or, in my case, Pencil). Keeping my Apple Pencil close at hand makes it easier to multi-task between iPad and Mac. You can use any mouse with the pad, of course, but there’s something especially attractive about the look of the bright white Magic Mouse and Apple Pencil against the dark leather background. For someone like me who works extensively (and often simultaneously) with both a desktop Mac and an iPad Pro, the ability to keep my Pencil at hand is irresistible. The all-leather surface of the mouse pad is the worst offender when it comes to the humidity problem I mentioned above. Still, it won’t be an issue if your space is climate controlled. 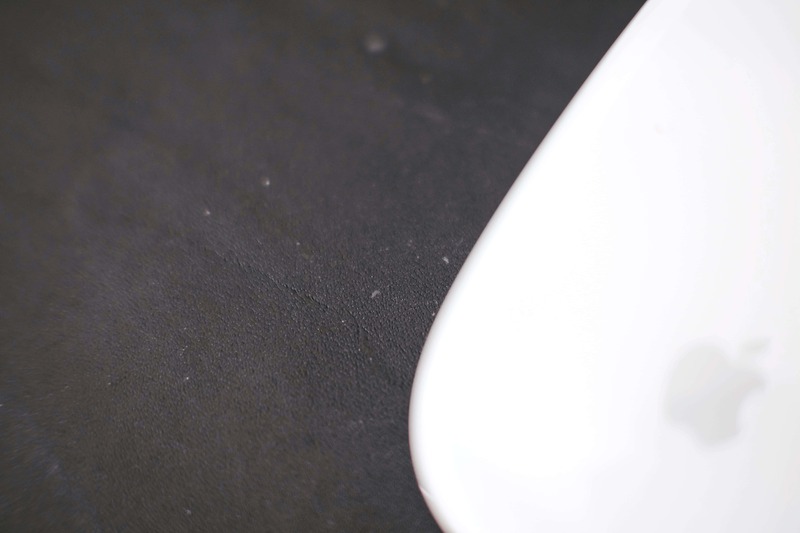 In all other respects, the leather is appealing — I think Grovemade’s choice of materials was wise. The leather surfaces are finely textured and are just now — after six months — beginning to show some patina. Over time, the leather has begun to show signs of wear, but not in a bad way. It’s the expected patina that makes leather a favourite to begin with, and the mouse pad’s larger surface makes it the most apparent showcase of this effect. So far (after nearly 6 months of daily use) the wear is extremely subtle and nothing but attractive. 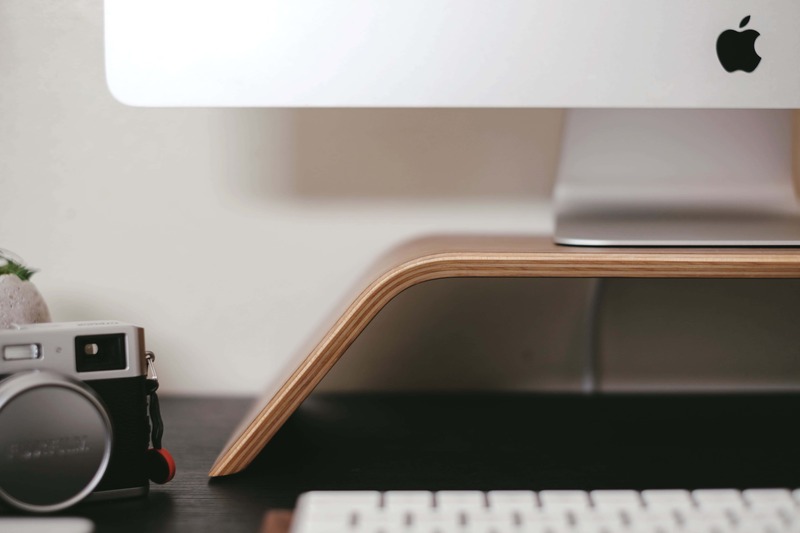 The largest piece of the Grovemade puzzle is the monitor stand. A beautiful arch for your monitor, or your entire computer if you’re an iMac user. 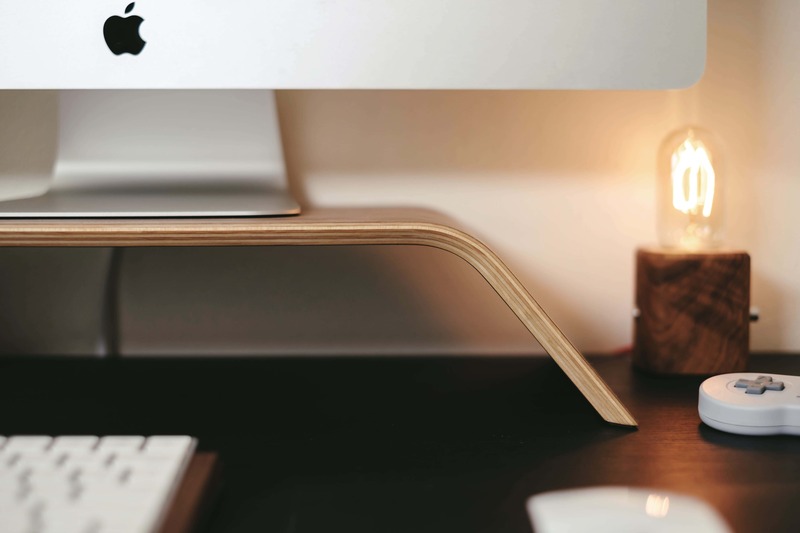 Moulded and laminated in LA, this svelte arch serves as a sturdy platform for your computer monitor, or in the case of an iMac, your entire machine. And don’t worry about weight: it’s built to hold up to 200lbs. Beneath it, there’s plenty of room for external storage, USB hubs, notebooks, or snacks (don’t judge). Still, this is the piece I spent the least amount of time with because my desk already has a raised platform for monitors. Instead, the monitor stand became a fixture on Shannon’s desk, supporting her Retina iMac. This worked out well for the most part, though she eventually opted to remove it because it was placing the iMac a bit too high for her. 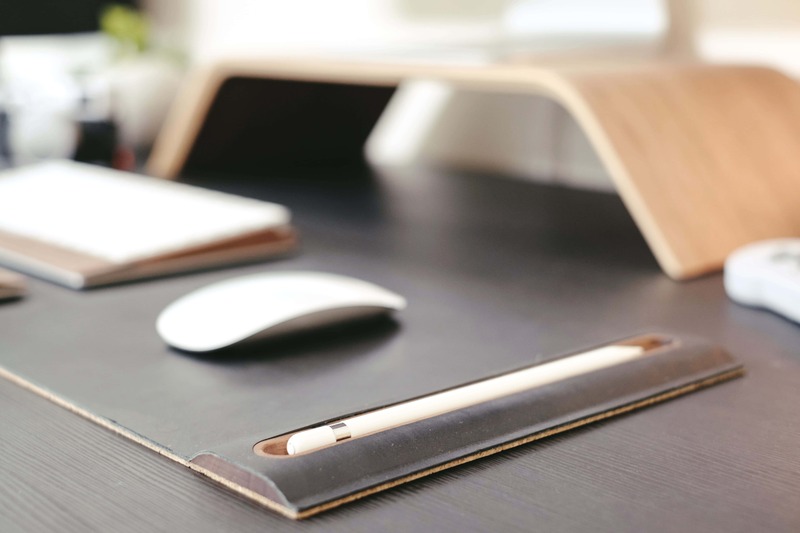 Depending on your desk and chair setup, and how tall you are, the Grovemade stand might actually elevate the display too much for comfort, leading to bad posture and neck pain. Still, the stand does its job admirably in most cases and I can’t wait to replace this desk with one that has a single surface so I can finally put it to good use. The final two components in my Grovemade Desk Collection are the pen cup and desk lamp. They’re very similar in shape and size, each carved into a three-inch tall rectangular block of the same hand-sanded walnut. They differ only in what’s done with that interior space. A lot of thought went into the design of even the simplest elements of the Grovemade Desk Collection. 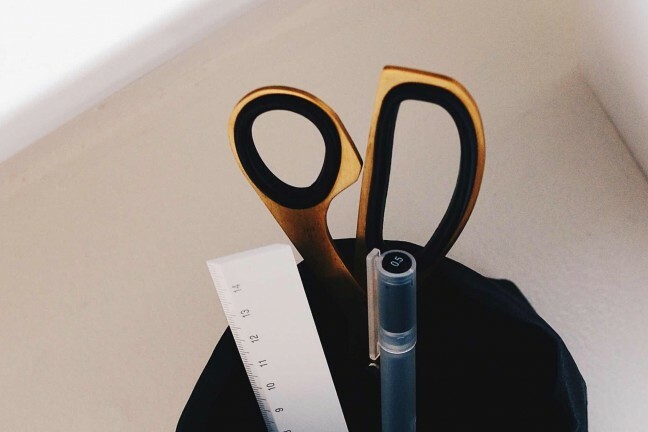 As you might imagine from the name, the pen cup is most directly useful as a holder for your writing utensils (you can fit about six comfortably), but in truth there’s nothing stopping you from using it as a general catch-all cubby for your desk knick-knacks. The interior is finished in metal, with the bottom cut out to reveal the cork underneath. This serves to keep the pen tips from sliding around too much, but it also has the side benefit of preventing loud clinking noises when you toss one back in. Details. The desk lamp offers little more than a decorative glow, but that’s enough to make me love it. The desk lamp was just too cool to resist. It’s definitely the least practical of the items, but that’s hardly a complaint. Seated in the same wooden frame as the pen cup is a 30-watt radio tube bulb. The thread is normal sized (E26), so you can fit any standard bulb you like (including a Philips Hue or other smart bulb!) but really this looks best with the unique tube bulb in place. 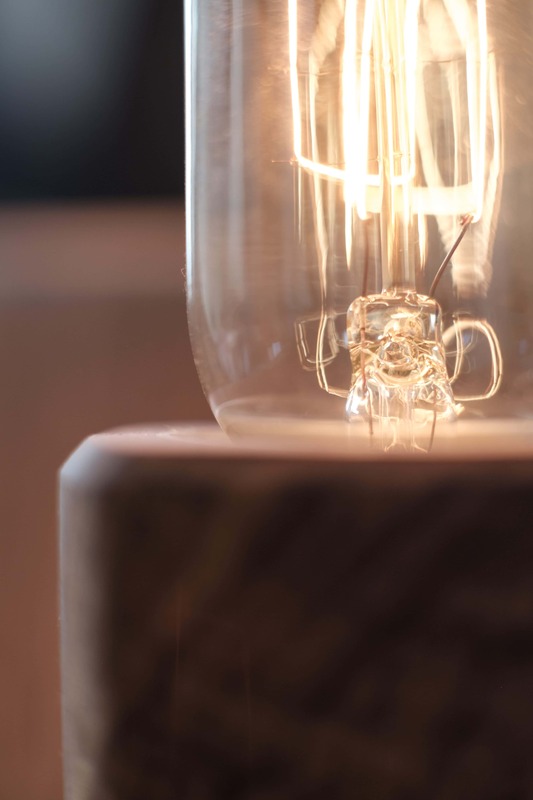 A unique exposed tube bulb is what lends the desk lamp its charm. Turning it on casts a warm glow over the desk. Not bright enough to be distracting (or especially useful, frankly) but enough to provide a pleasing accent. There’s a steampunk vibe to it that I find tremendously appealing, and after a bit of thinking I’ve found a perfect use for it. It sits on the side of my desk closest to the door to serve as a signal to co-workers: when the light is on, I’m in work mode and am not to be disturbed. The thick metal cylinder switch pushes from one side of the lamp to the other. It’s easy to operate, even in the dark. The light is controlled by a thick metal cylinder switch that you push in from one side of the lamp to the other. It’s made from the same brushed metal as the rest of the Grovemade products’ accents, and it’s very easy to operate, even in the dark. The bright red, woven power cloth is the only downside of the desk lamp. This cord isn’t exactly subtle. The only downside of the lamp is actually one of the aspects highlighted in the product description: its woven cloth power cord. 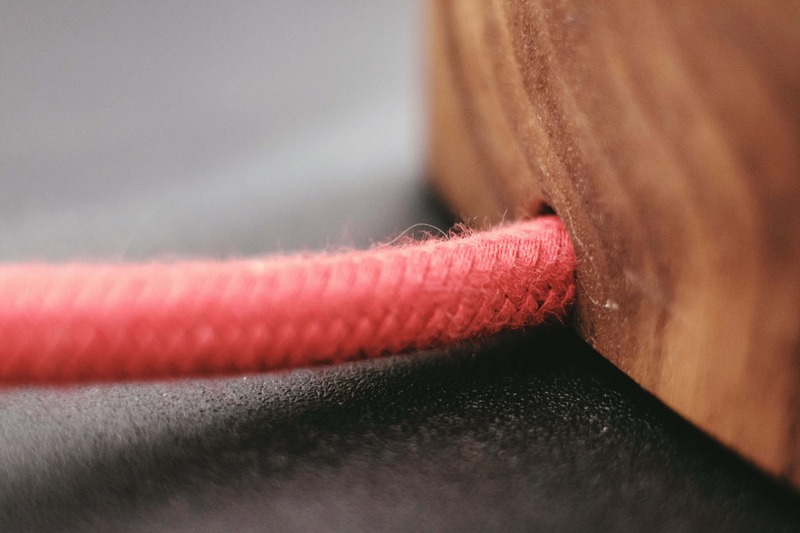 While I suppose it is very durable, the cord is thick, stiff, and bright red. Not exactly subtle, and a bit of a pain from a cable management perspective to be honest. Still, it’s a small complaint and one that does little to diminish the appeal of the desk lamp as part of a Grovemade setup. There are a few pieces of the desk collection that I don’t own (yet…) and thus can’t comment on, but are worth mentioning. 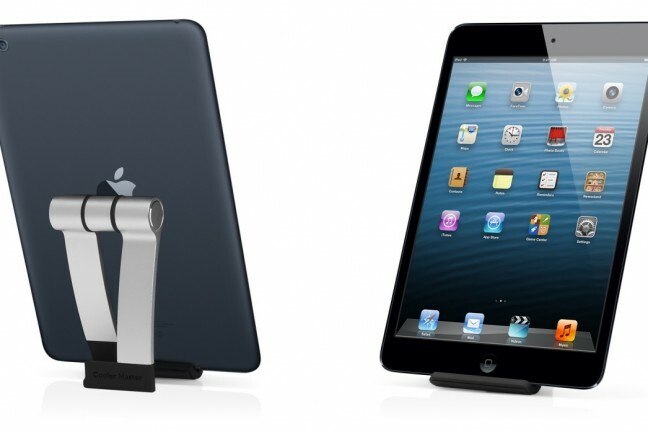 For laptop users, there are two additional stand options: a dock, and an angled stand. 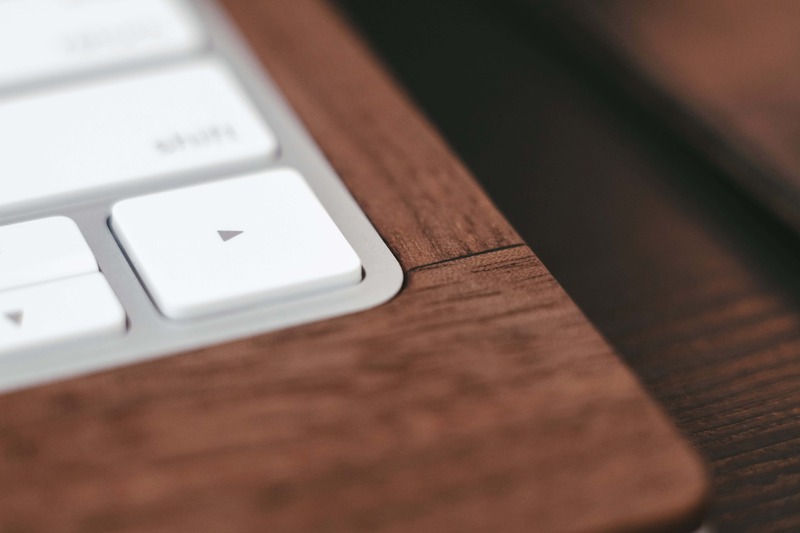 The dock is specific to MacBooks as it’s machined to their precise dimensions; you’ll have to choose your model before adding it to your cart to ensure a perfect fit. Owners of the new Touch Bar MacBook Pros will have to wait as there isn’t yet a dock available at this point in time. The angled stand is more agnostic, serving as a simple platform that holds any laptop at a more comfortable angle while elevating it to a more ergonomic height for desk use. It’s very similar to the monitor stand, but with an angled surface and leather-lined stop at the bottom to prevent the computer from sliding off. There are also a few smaller accessories available, including a tray for your Magic Trackpad (either generation), a small dish (perfect for paper clips or loose coins), two sizes of planter (for your favourite mini succulent or baby bonsai tree), and of course an iPhone dock (available in sizes appropriate for iPhones 5 through to 7 Plus). Over time, I’ve come to dislike my desk again. This time, it’s an exciting problem. Once I find the ideal desk, I already have all the accessories I need to make it look just the way I want. It’s like moving into a new house and already having the furniture prepared. 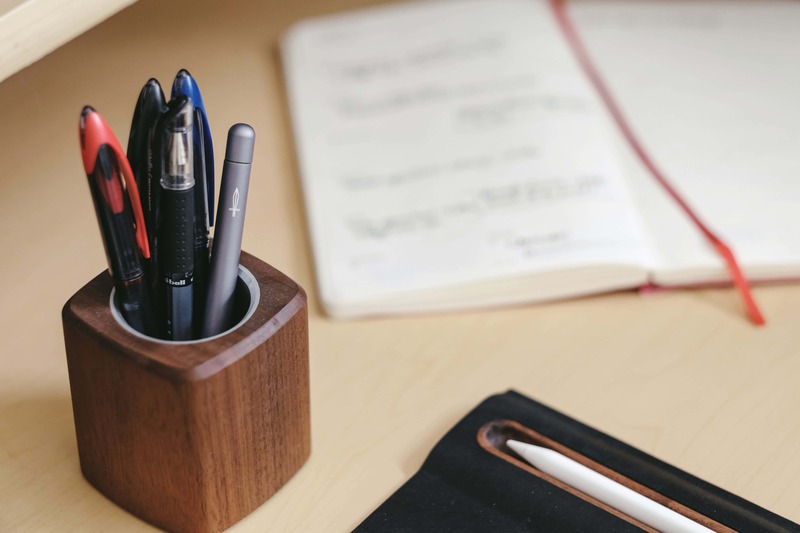 The Grovemade Desk Collection has made a surprising improvement to my workspace, and while individual items have some circumstantial quirks, there are no glaring downsides to any of the pieces. 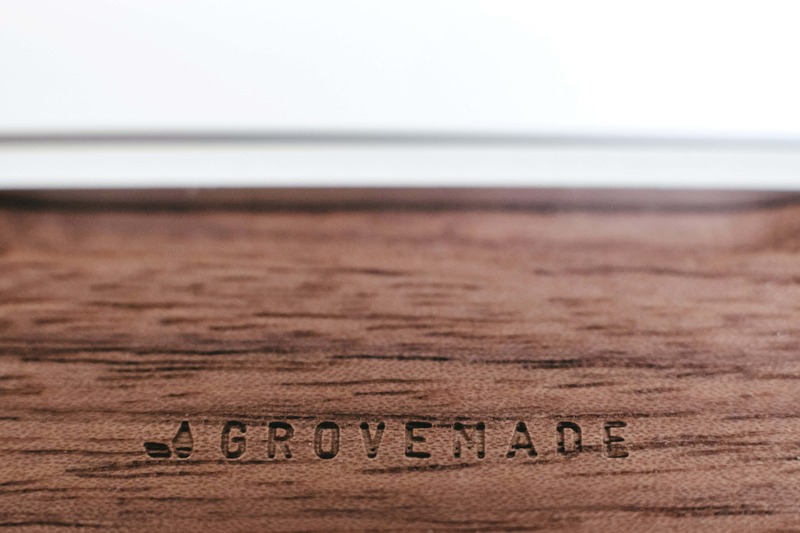 There are no glaring downsides to any of the Grovemade Desk Collection pieces. When I get my new desk, I’ll already have all the accessories I need to make it look just the way I want. With almost half a year of daily wear and tear on the Grovemade Desk Collection behind me, they still look and feel as good as new (with some character creeping into the leather). I’m confident these pieces will be with me for the long haul.